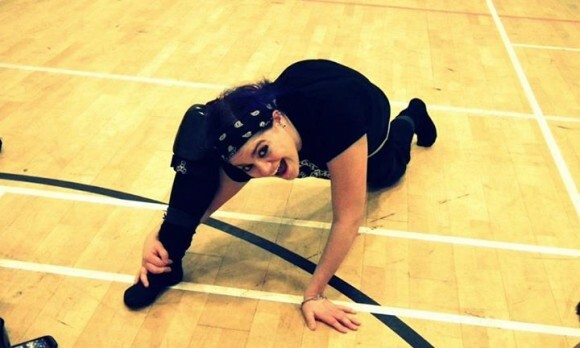 So, back in November 2011, I had a bit of an accident and broke my ankle whilst practicing transitions. “Rats!” I thought, as I lay in the ambulance sucking down the gas and air, “There goes my new favourite hobby.” When my mum came to visit me in hospital, I was given strict orders to get rid of my kit. Being the wayward daughter I am, I had no intention of following those instructions. All through-out my recovery, I knew I wanted to get back on skates. What did prey on my mind a lot was whether I should skate again. What if I did it again? What if I did something worse?? I hadn’t even got to the stage where I was bouting yet, and I had managed to injure myself so badly, imagine what could happen when I was taking real hits? Everyone that I had been learning with had improved massively, and I was about to go through the “Bambi-on-wheels” stage all over again. I wanted to be happy for my team-mates and celebrate their success; but inside I was unbearably jealous, not only of their progress but also of the relationships they’d all developed through skating together. I decided I had to get back on wheels ASAP. I put my skates on again for the first time in August 2012, almost 10 months after they’d been taken off me by the paramedics. I hoped I’d feel great – fearless, excited, keen to get back on track. Instead, I just felt scared. I love my team-mates and had missed them like crazy; I missed the physical exertion of practice, the drive to hit the gym, to eat better, to get fitter. But the reality of the situation was that I was pretty much terrified of hurting myself again, and the nerves really got the better of me. Now, I was always a little slow on the uptake of new skills, but since my accident I feel like it takes forever for me to learn anything. It’s a mental block and I really need to get over it, but man, I am such a scaredy-cat now! Scared of jumping, scared of transitions, scared of skating really close to others, scared of my own shadow, blah blah…BUT I have an amazing, supportive, inspiring team behind me. My coaches take the time to work one-on-one with me when I need it and more importantly, they don’t talk down to me. I know there are a lot of skaters and teams out there who would just tell me to MTFU and get on with it, and a lot of coaches who wouldn’t give me the time of day. Believe me, if you’re thinking I’m being pathetic and needy and I have no place in a derby team – well, I’ve told myself all of this and more! 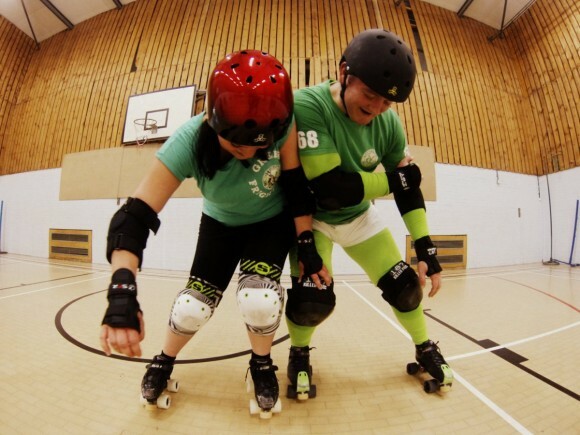 Sometimes when I’m struggling at practice, I’ll dodge out “for a wee” but I’m actually just trash-talking myself in the mirror! But I feel like I am finally (with a lot of patience from the coaches, and some special consideration from the rest of the team when working on hitting) making progress; and yes, sometimes I will step back from pack drills, but all this seems to have made quite a bit of difference. I’m inspired by the great skaters that we have on our team and skating outdoors has also really helped my confidence and stability – amazing how tripping over sticks and stones and landing face-down in goose poo will do that for a girl. I know others with similar injuries who just sprang back onto their skates as if nothing had happened; but then I also know people who’ve had a similar injury and not been able to set foot on track again. Instead of being jealous of all the skaters who have made it onto the team, I’m trying to turn my envy into a positive force, and use them as role-models. I could totally be where they are, one day. I can do this. This entry was posted in Experiences by FeartrixRotter. Bookmark the permalink.